Automated Control Pty Ltd announces an expanded range of speciality I/O products from Advanced Micro Controls Inc. (AMCI) for PLC-based control systems. AMCI’s AnyNET I/O family is a distributed I/O system that combines hard-to-find speciality functions with a network interface, simplifying installation and cutting costs. The innovative product design of the AnyNET I/Os also optimises network performance, and ensures system integrity. 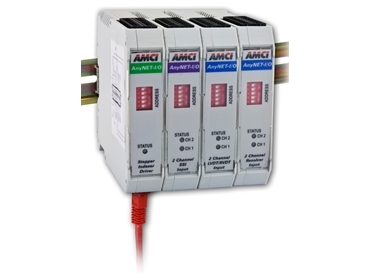 Allowing users to mix and match functions such as stepper motor control, SSI, resolver and LVDT/RVDT interfaces into a single solution, the AnyNET I/O range is compatible with any networked PLC/PAC and is easily programmed through the host PLC’s software. AnyNET I/O easily expands from one to six I/O modules by stacking additional units onto the gateway, and only requires a single network connection for all communications. Different speciality functions can be combined on a single network connection, allowing customisation of powerful automation solutions for any PLC-based application. Key features of AnyNET distributed I/Os include compatibility with any networked PLC or PAC; built-in network interface; up to 6 AnyNET I/O accommodated on a single network connection; easy programming without additional software; interfaces available for stepper motor control, simple sensor interface (SSI), resolver and LVDT/RVDT; and DIN rail mounting. Automated Control specialises in Australia-wide supply of process and automation control equipment to a diverse range of industries encompassing water, industrial, food, mining and petrochemical markets.